We shall see how these babies like the NW terrain. ;) I'm going to run these to the ground! This time the quest for a new shoe was a little different. I had a Dog help me. A Shoe Dog! The local Road Runner Sports store has the whole treadmill & computer setup for foot/gait analysis and I was persuaded (actually demanded) by Liz to go get analyzed. It was pretty interesting actually. 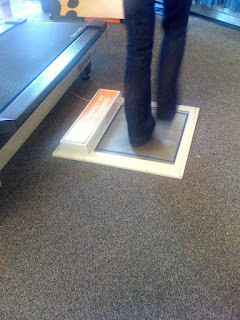 After showing off my "lovely" bare feet (with only three toes polished on each foot...an awesome trick for peep-toe heels), I walked over a little pad on the floor to have each foot scanned. The result was intriguing, especially since the Road Runner guy said my arches were high. Really? I thought I was in the middle range. Hmmm. Also, my walking gait was also more centered than I thought. 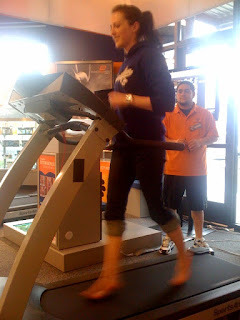 Then I hopped on a treadmill in my jeans and bare feet for the video portion of the analysis. I knew that this would be WAY different than just walking. I was right. 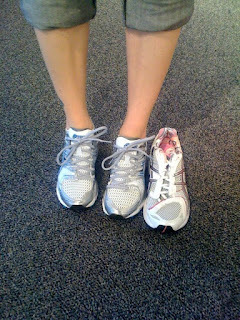 My ankles cave inwards, aka "over" pronation...ouch! Watching the video in slow motion just made me cringe! But, guess what shoes were suggested? Gel Kayanos! But, since mine have been wearing out a lot, fairly quickly, I decided to try a new brand just in case. Thus, the New Balances were selected. Of course I had to admire the Kayanos (old 15s and new 16s) side-by-side...pink is so pretty! Yeah yeah, I know it's not supposed to be how it looks, but the fit. Wow - awesome. 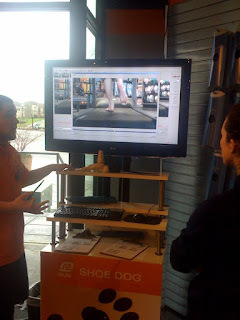 I've always wanted to do that gait analysis thing at RRS! Love that anlysis, I may head over there just for FUN..
FYI the 16's are HEAVY, have NO CUSHION, and I do not like them. I am going back to Fleet Feet for a new fitting. UGHO!! Don't you just love new shoes. I know you're not supposed to care about looks. But what evs you spend hours a week in those things. They've got to be pretty. I totally want to get that done. Wonder if anywhere around here does that? Good luck with the new shoes!! 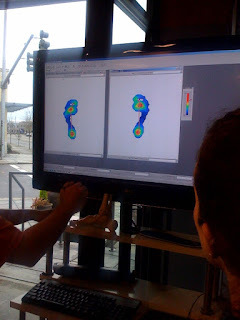 Gait analysis' are so much fun because you learn so much about your stride! I love my Kayanos! I am in the process of switching to a new pair, but I think I somehow bought the wrong size...my feet went numb on my last run! Yikes! I had a gait done last summer and it was so cool to see- I over pronate something fierce! When I pick out new shoes and two pairs fit similarly, I will *always* pick the cuter pair. We are girls and that's how we do! Great pictures. I'm going to look around for getting this done somewhere. I've put quite a few miles on my Asics since I got them in September. Time for a new pair! I've always wanted to have this done - you've inspired to to make it happen! Hope you love your new kicks! Pretty shoes! I hope you love the new ones! New shoes are always awesome (if they're the right ones, that is)! 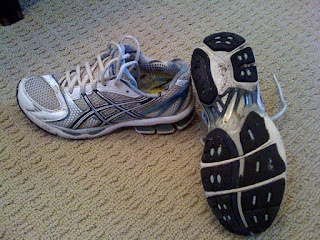 Not sure what you do, but when I have a pair about to wear out, I use them for my short, slow recovery runs for a few weeks, just to milk them for some extra miles. I need to get a gait analysis, too. I'm pretty sure I don't have great biomechanics! Yay! I'm really liking my New Balances. I liked the Shoe Dog thing, too. Looking at your photos, though, that's how my arches were and the girl said that I DIDN'T have high arches -- they were just on the higher end of of whatever the middle range is. Interesting. Anyway...YAY for new shoes! That analysis thing for shoes is cool. I normally just end up with whatever is not too expensive/comfy. So cool!! I love all that high tech selection stuff!! Your new ones are cute too though! I had the same problem with the Kayanos - wearing out very quickly. 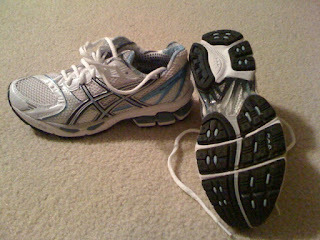 I moved to the Asics GT2150s - same support, a little less cushion, but way way more wear. If the New Balance don't work out, remeber the GT 2150's! I wish like the dickens I had a roadrunner sports here, I want that analysis so bad! High arches can be effectively treated with orthotics that provide biomechanical support and help feet to function more efficiently. 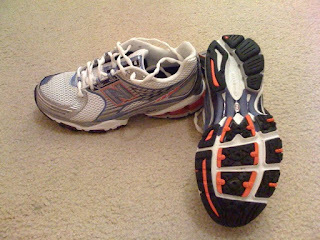 The most effective orthotics are those which are custom made to fit your foot. A full gait analysis with a Podiatrist could be benefical for you if you experience any pain as they will be able to prescribe orthotics for you.